The ZAG range of enclosures comprises of 19 different sizes of enclosures and is precision die cast in AL-Si 12 grade (LM24) aluminium alloy. This is considered to be the most suitable grade of aluminium for maximum corrosion resistance especially in salt laden atmospheres. Additional optional protection methods such as alochrome, anodising and epoxy polyester painting coupled with the fitment of captive 316 grade stainless steel lid retaining screws further enhance the anti-corrosion properties of the enclosure. The wall thickness is sufficient to allow tapped entry holes to be machined into the walls or the base of the enclosure. ZAG Aluminium Enclosures are suitable for use in hazardous areas and can be supplied with a number of certificates; ATEX EEx‘e’ to BS EN 50019 (zone 1 & 2) EEx ‘nA’ to BS EN 50021 (zone 2) and NEMA 4x (CSA, UL & FM class 1, division 2). ZAG Enclosures can also be supplied fitted with any component approved terminal to apparatus level or can be supplied empty as component approved for the clients own certification requirements. Please contact us for more information. Certified for use in Zone 1 and Zone 2 Hazardous Areas. Wide Operating Temperature (- 70ºC to +130ºC) (-94°F to +266°F). 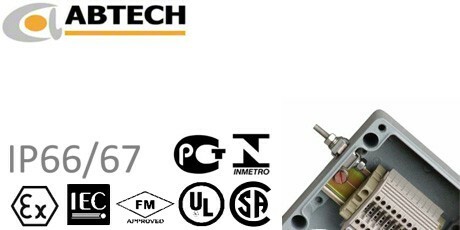 UL, CSA, ATEX, FM, InMetro and GOST approved. Ideal solution for Marine and Petrochemical applications. Ingress Protection rated up to IP67. Available in ainted and unpainted versions. Impact Resistance > 7 Nm. Enclosure can be drilled and tapped to accept most thread forms (eg NPT). Abtech ZAG Enclosures feature a labyrinth seal system, similar to the seal featured in the BPG range of enclosures, which ensures the seal is protected from external forces. As a result of this seal system the ZAG range offers excellent ingress protection qualities rated to IP65/66/67. The mounting holes of the ZAG design are contained in the profile of the enclosure but sit outside the seal. External fixings and fasteners are produced from grade 316 stainless steel ensuring reliability of the enclosure and if required, the ZAG range can be supplied with optional external stainless steel mounting feet. ZAG Aluminium Enclosures can be drilled and tapped with various thread forms and accept many paint colours and finishes. Abtech ZAG Enclosures are designed for a number of applications which include hazardous area and industrial junction boxes, and in particular this range is an excellent choice for use in OEM installations, due to the excellent machining qualities of aluminium. The ZAG Aluminium Junction Box range is ideal for engraving instructions or decals while at the same time offering a durable solution. In addition silk screen printing available on request. These bespoke solutions in the Abtech ZAG range can be supplied in relatively small production volumes, offering a cost effective solution for manufacturers looking for an economical enclosure without having to commit to unrealistic volumes sometimes required for custom designs. aluminium is an excellent conductor, earthing for cable glands is provided through contact with the enclosure wall with no further earthing required. Zag Aluminium Enclosure are suitable for ambient temperatures from - 40ºC to + 80ºC (-40°F to +176°F) when fitted with a standard neoprene gasket. If required the temperature range can be increased to - 70ºC to + 130ºC (-94°F to +266°F) when fitted with an optional silicon gasket.